Our Pre-School program continues to help your child learn, and will continue to prepare them for the rigors of grade school. Like our Pre-K Program, our Pre-School Program follows the same creative curriculum. We base all classroom exercises as fun and hands-on. We find that this is the best method of engaging young minds to learn and develop. When presenting problem solving and challenges as fun play, children learn more easily and retain more information. Free Breakfast, lunch and snack. 1 – 5 year olds. All teachers are trained and certified. Children in the Toddler room are encouraged to learn new words and try to use them words to express their needs and wants. The activities in the Toddler room are developed to create learning experiences and social experiences through play, projects, and activities. A daily sheet is sent home to let parents know when their child was changed throughout the day, if they ate, and what they may need. The two’s room provides an inviting atmosphere that encourages fun and discovery while promoting social interaction, independence, and emotional development. Students are introduced to circle time activities including days of the week, counting, story time, and songs. 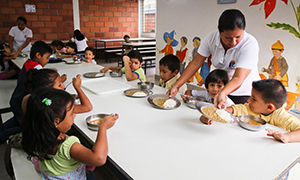 During the course of the program teachers use weekly themes to promote independence through teacher directed and child centered daily activities. The children are encouraged to make friends, share and communicate with their classmates using their “words”. Self-help skills such as eating skills, potty-training, hand washing, and independently cleaning up are among the skills taught in this room. Each child is sent home with a daily report that explains toileting, eating, and what is needed. Our preschool three’s program is a safe environment where children can learn and have fun. The program emphasizes independence, community and collaborative learning. During the course of the day, children are encouraged to make choices for themselves, cooperate with others as well as listen and follow directions. In preparation for Pre-K children participate in circle time activities including calendar, weather, counting, story time, music and movement. Through free choice learning, the children can explore the classrooms learning centers such as science, math (manipulatives), language, writing, art, blocks, and dramatic play. These learning centers help the children grow socially, emotionally, and intellectually. Next Generation Academy can prepare your child for a challenging world ahead!